A link to some timely commentary on the anniversary of 9/11 from Ashbrook Center Director, Peter Schramm. Impoundment Si, Payroll Tax Holiday, No. Kevin Williamson argues against Mitch Daniels' idea of a payroll tax holiday and I must say I agree with him. There was a time I was agnostic about the wisdom of a "timely, targeted, temporary" stimulus program. It seemed worth the risk of the extra debt, if the stimulus could significantly moderate and shorten the recession. A payroll tax holiday seemed like exactly the right way to go (if you were going to go the stimulus route), but that isn't what we got. Now, almost three years into this lousy economy, another government attempt to prop up demand doesn't make much sense to me. The good news is that after the failure of the Obama stimulus, Cash For Clunkers, and the temporary homeowners tax credit, the public might be ready to turn away from quick fixes and toward an agenda that can plausibly offer a stable policy environment for investment and sustained, broadly (if unevenly) rising living standards. On the other hand, I think Daniels' idea of pushing Congress to grant the President an impoundment power makes both electoral and policy sense. Campaigning and the legislating on specific budget cuts is difficult because of the problem of concentrated benefits and diffuse costs (cough, ethanol subsidies, cough.) That doesn't mean that there aren't tens of billions of dollars in the federal budget that could be impounded with the vast majority of voters a) not noticing the money wasn't spent and b) being unmoved at the consequences of the money being unspent. The problem is creating an incentive system in which the unorganized majority that does not benefit from this spending can be rallied against the well organized interests which are well placed to push for spending within congressional electoral and appropriations processes. The impoundment power gives the President (if inclined) the ability to rally the general interest against particular spending interests. But why would Congress grant the President this power? Partially because it would be in the interest of individual members of Congress to do the granting. Giving the President the power to impound wasteful spending could be a very popular issue. Fiscally conservative members of Congress would want to grant the power because it would be a tool to restrain spending. It would also allow them to plausibly argue in favor of spending restraint without having to go through long lists of spending cuts that induce rage in the spending interests and mego (my eyes glaze over) in everyone else. More opportunistic members of Congress (especially Republicans) might be convinced to support granting the impoundment power because campaigning on the issue might help the Republicans win congressional majorities and the chairmanships that go with majority status. Supporting impoundment might also help Republicans of suspect conservatism avoid embarrassing primary defeats. Impoundment wouldn't be a substitute for a poltic and relevant agenda on taxes, health care and entitlements, but it could play a part in shifting our electoral politics in a more limited government direction and bringing the budget under control. may seek to exploit our freedoms, but we will not sacrifice the liberties we cherish or hunker down behind walls of suspicion and mistrust. They may wish to drive us apart, but we will not give in to their hatred and prejudice. For Scripture teaches us to "get rid of all bitterness, rage and anger, brawling and slander, along with every form of malice." This meekness Obama declares on "a day of remembrance, a day of reflection, and -- with God's grace -- a day of unity and renewal." And what does this unity consist of? And what virtues and values make us one? Evidently the most unAmerican person is an angry one. It follows that the American should lack this most fundamental passion for politics. (This said at the Pentagon!) I suppose we should save our anger for BP executives, Republicans, fanatical pastors, etc. Like generations before us, let us come together today and all days to affirm certain inalienable rights, to affirm life and liberty and the pursuit of happiness. On this day and the days to come, we choose to stay true to our best selves -- as one nation, under God, indivisible, with liberty and justice for all. But contrary to Obama's suggestion, defending rights and being angry are inseparable. When justice is the goal, anger humanizes. Moreover, maintaining there is a right to burn a Koran and a right to build a mosque near the 9/11 site reveals utter confusion about rights. As Lincoln argued in debating with Douglas, there is never a right to do wrong. In a regime of freedom, we permit willful, stupid, and even immoral actions to occur without punishing them. And defending such actions as rights diminishes their dignity and what makes virtues of real rights. Freedoms of speech, religion, and property become mere "values," which can be bargained away or accommodated like anything else. Hence 9/11 becomes a day for anaesthesia. We have started seeing some daylight between the president and his secretary of state, and, as Con Coughlin notes, there is also a growing sense among Democrats that they chose the wrong candidate. Of course, there is no reason to think that this opinion will abate after the November vote. And not your yellow hair." And not my yellow hair." Michael Barone writes a compelling essay today in which he compares the political arrogance of today's Democrats to that of the Democrats in 1854 who passed the Kansas Nebraska Act. In both situations, Barone notes, Democrats had large majorities and a young President who seemed to rise up out of no-where to the heights of personal popularity. In both cases, the justification for passing an intensely unpopular piece of legislation without first securing popular sentiment, was that the people would come to appreciate the thing once they had come around to understanding it. An interesting comparison, that. It is striking, of course, how unwilling Americans seem to be to come around to an understanding of things their Democrat betters foist upon them. You'd think that 156 years of experience in this regard might force some Democrats to come around to understanding that. David Frum writes that congressional Republicans need an agenda if they are to make the most of their (hopefully!) forthcoming gains and offers a Contract With America for 2010. Even if Republicans don't take up Frum's Contract, I think that such exercises can be useful. As Reihan Salam pointed out today, constructing policy agendas and building support both within and outside a partisan coalition for an agenda is an important, early and crucial step towards policy reform. I think Frum's effort is thoughtful, but I have some pretty big reservations. On Taxes - He wants to repeal the tax increases in Obamacare. So far so good. He also wants to extend the Bush tax cuts for another five years, have an eighteen month payroll tax holiday and speeded up expensing. That isn't a bad plan and Mitch Daniels offered something similar, but I'm skeptical of what amount to rightish versions of stimulus. The challenge is coming up with a set of long-term sustainable policies that can win majority support and make the US economy more competitive. This means a tax program that offers significant and long-term direct benefits to most working families and encourages growth year in and year out (rather than a short-term demand spike.) I prefer something like the family-friendly and pro-growth plan offered by Robert Stein along with maybe some kind of cut in the corporate income tax. There are reasons to not like the plan since it raises income taxes on some high-income voters, but it keeps the top income tax rate at 35%. On Debt - Frum wants to cut federal aid to states. I see his point. I personally prefer a Cash for Cuts approach in which federal dollars are made conditional on structural changes in state government that bring state and municipal budgets under control. Health Care - You can read Frum's suggestions yourselves, but for me, Frum's proposal amounts to a Liberal Republican version of Obamacare. Frum is right that repeal sentiment, in itself, is likely to fade over time, but I'm not so sure that young voters will be as indestructibly tied to an Obamcare-type system as Frum thinks. Obamacare basically forces younger people to either pay too much for their health insurance or else pay a fine for the privilege of having no health care coverage whatsoever. For younger cohorts, Obamacare (for all the problems) might actually beat out a Republican message built around repeal and incomprehensible slogans about socialized medicine. But a Republican alternative that offers low-cost catastrophic coverage options for the middle-class young, state reinsurance pools for those with preexisting conditions, and a reformed and market-oriented Medicaid program for those with low-income might seem like a pretty big improvement over Obamacare. Megan McArdle writes that health insurance companies are increasing premiums in response to Obamacare. Republicans (and right-leaning institutions generally) cannot talk too much about this issue. They should be talking about it now and in the years (and premium increases) to come. They have to capture the narrative that Obamacare is leading to higher health insurance costs. If they don't, the narrative will be "Mean insurance companies are picking on people which why we need price controls and a government-run program that will produce a single-payer system." If the pro-government run health care narrative takes hold, conservatives will find themselves in the absurd position of defending the Obamacare-created status quo as the only politically viable alternative to a fully government-run system. Republicans should be talking about premium increases and linking them to Obamacare at least as often as they talk about taxes. It also wouldn't hurt for some right-leaning 527 to buy one or two minute ads on programs with audiences that don't consume much right-leaning media. One set of ads could explain what is wrong with Obamacare and a second set of ads could describe the potential benefits of market-driven health care reforms. It would be expensive, but it would also be a down payment for shaping the health care debate in a reformist direction. 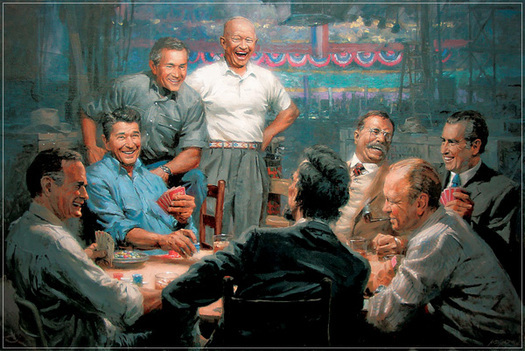 "Barack, I know Abe Lincoln, and you ain't Abe Lincoln!" A provocative question for our times (and for quite some time): How does Islam fit into western civilization? There is the view of Raphael's "School of Athens," where Averroes (far left) sits among other great philosophers, and then there's this view, in a poster announcing a talk by a friend of mine. Dante has a similar opinion of Islam. Here is a longish but well worth reading summary of Obamacare's likely impact. It goes well with Avik Roy's explanation of how the mandates and rules making process created by Obamacare gives the government the authority to quietly strangle the private insurance market. One thing that strikes me is that health care policy is a long-term battle of position within a constantly changing environment. Liberals have managed to shape the environment in such a way that if conservatives are not winning policy victories, they are losing - if only slowly. The NCPA report makes it clear that Obamacare will speed up the unraveling of our system of employer-provided health insurance, increase the number of people on government-provided insurance, mandate participation in a destructive and irrational system of comprehensive health care prepayment, and make the middle-class dependent on government health care subsidies within an environment of sharply rising premiums. Obamacare is, in and of itself, a big step toward government-run health care, and in the years to come, it will slowly shift the political battlefield ever more in favor of ever more government control. Republicans holding office won't stop these changes. If Republicans win control of Congress in 2010 and Obama vetoes Republican attempts at repeal (assuming the Republicans can even beat a Democrat filibuster in the Senate), nothing changes and we stay on our path to government-run health care. As Obamacare changes our health care market and health care politics, a policy of simple repeal will (by itself) become less and less the basis of a winning politics. The old Republican policy of "tort reform plus not much" won't get it done. There is nothing wrong with tort reform, but is doesn't address enough problems to become the basis for a winning politics of health care. Tort reform has mostly functioned as a kind of conversation stopper for conservatives who didn't really want to talk or think much about health care. Oh, the Senate Democrats are filibustering tort reform? That just means they aren't serious. Let's talk about cutting taxes. A "get government (or even just the federal government) out of health care" rhetoric is of course a kind of self-marginalizing literary politics. There will be significant government involvement in the provision of health care (if only in the form of tax subsidies and provision for the destitute) under any realistic scenario. I hear this line of argument on talk radio every once in a while and it is just another conversation stopper. It is even worse than that. It doesn't so much stop the health care conversation so much as it leaves the conversation to be dominated by liberals. A Ryan Roadmap-type tax change that produces a leap into individually-owned insurance is probably too big a step to win majority support. It would seem to leave people and their families naked in the health care market with only a (insufficient seeming) tax credit for help. This problem becomes worse as premiums rise and people feel even more vulnerable and afraid of being on their own. A winning conservative politics of health care will mean assembling and relentlessly pushing a set of incremental policies that do two things. First, they would have to be able to win not only majority support among the public, they will have to be consequential enough that voters will consider voting for those policies a high salience issue. This means a set of policies that neither do too little to motivate enough voters (tort reform plus nothing), nor do so much that those voters freak out (the Ryan Roadmap.) Second, the policies, once enacted, must shape the political environment in a way that future market-driven health care reforms become both easier and more popular. Those are some very narrow needles to thread. There are some obviously wrong answers, but the right answers are much less clear. I don't think there is any one right answer, but there are pieces of a potential right answer lying around waiting to be assembled (and somewhat changed) into a winning platform by a center-right party that is serious about winning the long and grinding health care battle. I know this will not shock any reader, but just in case you have been on the moon, it might be worth noting--on this day especially--that politics is now officially on: we are having elections in November, and not only is the news is unremittingly bad for the Democrats, but they are now admitting it. A CNN Poll released today is entitled, accurately, "GOP's midterm advantage is growing." The poll finds the GOP leads the Democrats by 7 points on the "generic ballot" question, 52 percent to 45 percent. That 7-point advantage is up from a 3-point margin last month. (I will not even mention that Rasmussen has GOP up by 12 points in the generic ballot). Also note this from CNN poll: "Sixty-two percent of independents questioned say they would vote for the generic Republican in their district, with three in ten saying they'd cast a ballot for the generic Democrat. That 32-point margin for the Republicans among independents is up from an 8-point advantage last month." If the Dems have a plan to hold on to the House, it might be revealed in this NYT article, and it is not impressive. They cannot run on the economy and health care, the two things for which they originally demanded credit. I am impressed at how hollow and unpersuasive Democratic voices are, how Obama has lost even some of his friends on the left, and how ill prepared they seem to be in understanding what is happening to them, and why. "With tight races for governor and senator, not to mention several close congressional contests, Ohio is likely to tell us not only which political party will be victorious but also how large the anticipated Republican wave turns out to be. If the GOP can win these toss-up Ohio races, then a repeat of the 1994 Republican landslide might be possible nationally. Wins by the Democrats, however, would likely indicate that their losses might be smaller elsewhere, more in line with those typically suffered by a president's party at this point in the calendar." The two latest polls in Ohio have Kasich leading Strickland by anywhere between 8 and 10 points, and for the Senate, Portman is ahead of Fisher by about a dozen points. Also, all the enthusiasm is with the Republicans. Along with everyone else, I understand that things can change, that anything may happen, that giddy minds might be busied with foreign quarrels, etc., and yet, it would seem that there will be a tidal wave of some kind (also see Larry Sabato's revaltively careful/conservative GOP predictions). None of the facts reveal any comfort for the Democrats. This WaPo notes the "mistake" in a quote in the new rug in the Oval Office: "The arc of the moral universe is long, but it bends toward justice," is attributed to King. In fact it was said by--as MLK made clear many times--the 19th century preacher and abolitionist, Theodore Parker (he was also one of the secret six providing financial assistance to John Brown's raid on Harpers Ferry). It is perhaps just that the quote from Lincoln--who admired Parker--"government of the people...", also originates from Parker. This Parker influence on Obama was noticed earlier. Conrad's cartoons were ideologically predictable (save an occasional pro-life one) but often clever and memorable nonetheless. (Then-Governor Brown as "Lord of the [fruit] Flies.") By comparison, leftists like the WaPo's Tom Toles are insufferable and a sign as obnoxious as Dana Milbank of why the paper is not respected. Michael Ramirez is top of the 'toon craft today, and I like Sam Ryskind as well.